Every week we bring you relevant news concerning the precious metals market and the overall economy. For this week’s news, gold defies financial forecasts and continues to rise in price. Gold experts from across the globe are convening to reform the gold-pricing benchmark to achieve transparency. Finally, gold expert Jeff Nichols projects a positive future for gold. Here are this week’s headlines. After a poor showing in 2013, the demand for gold is now back up and prices are defying previously skeptical forecasts. John Kinsey, a manager at Caldwell Securities Ltd., told Bloomberg, “Gold’s performance has proven the bears wrong so far this year.” In 2013, declining demand for gold sent the yellow metal down, and prices remained suppressed in the early part of this year. In recent months, however, while even in the face of government data showing an improved U.S. economy, inflation concerns and the omnipresence of geopolitical turmoil across the globe are herding investors into gold as a safe haven. Prices increased further after the Federal Reserve revealed its plan to keep interest rates low and Iraq and the Ukraine experienced escalating violence. The precious metal has rebounded from a 28% decline in 2013 and is up 9.5% so far this year. An accumulation of exchanges, central banks, bullion banks, mining companies, refiners, traders and other industry groups have convened to take part in a meeting to discuss reform of the gold-price setting mechanism. The current process for fixing the price of gold, initiated in 1919, involves the benchmark being set via teleconference twice a day in the morning and afternoon by the Gold Fixing Company, which consists of four banks: Barclays, HSBC, Societe Generale, and Scotia Bank. The benchmarking process came under criticism in May when Britain’s Financial Conduct Authority (FCA) fined Barclays approximately US$44.5 million as a result of one of its ex-traders admitting to attempting to manipulate the price of gold. Natalie Dempster, managing director for the World Gold Council (WGC), hopes the process, “will lead to a reformed and modernized gold benchmark which attracts a broader range of market participants.” Members of the WGC have yet to reach an agreement on overhauling or replacing the price benchmark mechanism. Respected New York gold analyst Jeff Nichols believes now is the right time to purchase gold. Predicating his reasoning on increasing demand for gold in the Asian market, Nichols also justifies the reasoning with inflated stock market values as well as an “accommodating” financial plan by the Federal Reserve, which entails low interest rates and continued Quantitative Easing. Growing incomes and the expanding middle class sector in China and India, the world’s two largest consumers of gold, may be consuming virtually all of the world’s newly mined gold output. 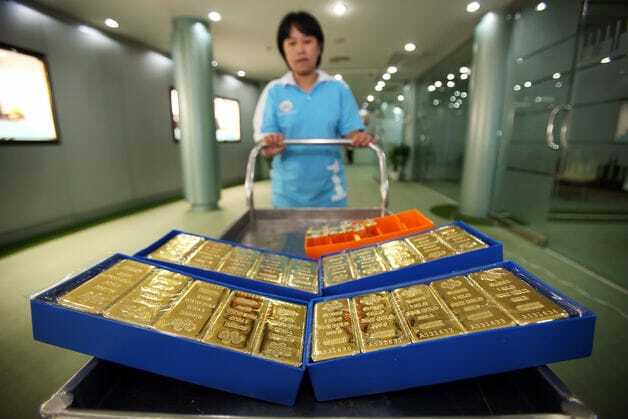 Asian absorption of the global supply of gold could lead to a shortage of the precious metal in the West, thus forcing prices to spike, according to Nichols. He also adds that the weak performance of gold over the past two to three years has been largely due to short-term returns in the equities market being superior to those achieved by gold. However, this may all change as the equities market is showing signs of being at or near a peak, especially as stock prices grow at a faster rate than can be justified by corporate earnings growth. However, even if the U.S. economy improves and the stock market continues to prosper, the price of gold is projected to continue to rise simply from the Eastern demand for the precious metal. With gold currently at a relatively low price, and anticipating higher prices in the near future, Nichols believes now is the opportune moment to purchase gold.